A new year always comes with New Year's resolutions and a list of goals to achieve in the upcoming year. 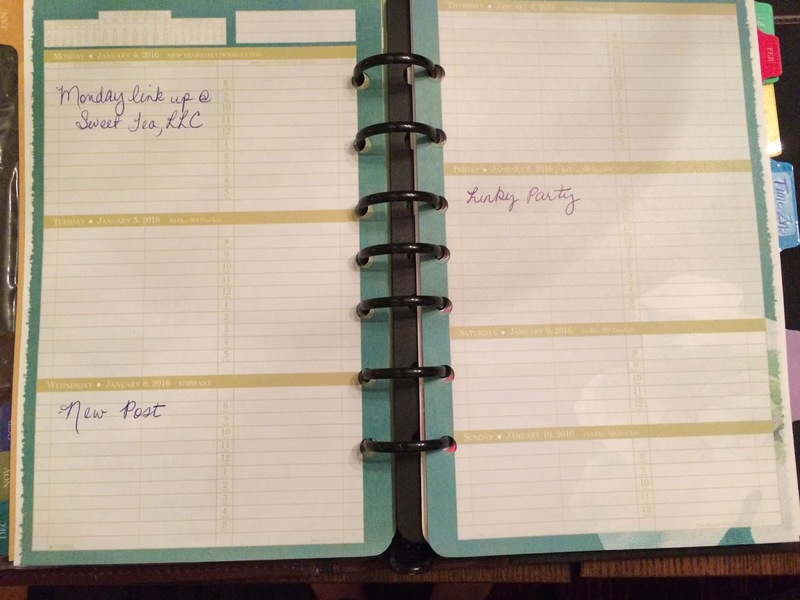 I am joining my blogger friend, Kirsten, from Sweet Tea, LLC in her monthly goal-setting and accountability link up. Being a new blogger, I struggle with many things, including coming up with quality posts, finding time to write posts, and promoting my blog, just to start. I feel that setting small monthly goals for myself will help me focus on one area at a time, so I will not feel so overwhelmed. In the short amount of time that I have been blogging, I feel like I have already done a few things well. I feel like I have created a few quality posts that represent who I am and what I want my blog to reflect. I have also connected with a few wonderful bloggers, who are at different levels, that have given me advice, encouraged me, and have been a wonderful support system. I have also joined a few weekly linky parties in order to engage with other bloggers and promote my blog. I know I have many things to learn, so one of my goals is to learn more about the back end of blogging in making my pages prettier and easy to read and navigate. I also want to learn about and begin utilizing post scheduling, because one thing I have struggled with is posting on a consistent basis. Another thing I want to learn, is how to use social media more to my advantage, to draw readers to my blog. One of the bloggers I have been lucky enough to connect with is Amanda at ALB Designs, and I plan on working with her to update my blog header and set up an email list. I believe that by writing my goals down and being accountable to all of you, my blogger goals can become a reality this year. I have learned from several time management and goal setting books and classes that you should make your goals specific, measurable, have a time table, and be attainable. I am a visual person, so I like to physically write my goals in my Daytimer so I can see my list and check things off as they are accomplished. Hopefully by the end of 2016, I will have established my voice and my niche and consistently be creating at least two quality posts a week. I would also love to grow my readership significantly and write at least one sponsored post per month. I hope you will join with me and set your own goals for 2016! Feel free to link up with me at Sweet Tea, LLC if you are a fellow blogger that needs some encouragement in achieving your goals! Congrats Mary, it sounds like you are off to a great start! I wish I would have had a good understanding of my goals when I started blogging. :). I'm excited to follow along and watch you grow! Thank you for your kind words! It helps to have people like you and Kirsten to help me and hold me accountable! Thank you girl! That means so much. Sometimes I feel so behind when I look at other bloggers, but I have to remember I am just starting out and am trying to take it at my own pace :-) I can't wait to work with you!!! We all have to start somewhere and you are doing fabulous! Here's to 2016 being an AWESOME blogging year! Thank you for supporting me and being so encouraging!! I hope you have an awesome blogging year too in 2016!! Great post and sounds like you have great goals! I'm so glad I was able to find your blog through the link up! can't wait to read more! Thank you for visiting and reading!! I hope you will come back next month and see how I am doing on my goals! Thank you Mary for sharing and referencing ABL. I just signed up to her newsletter. I'm writing my goals right now. Carol, Thank you for visiting and commenting! Amanda is so sweet, I know you will enjoy her posts. Good luck on writing your goals; I cannot wait to check them out! This is great! I set goals each month because I get easily overwhelmed with this blog thing. Thanks for linking through Waiting on Wednesday. I agree with you especially since I am just starting out and there is so much to learn. Thanks for having me at Waiting on Wednesday! I'm so excited to see what 2016 has in store for you Mary! I love your enthusiasm, both here on the blog and in our Facebook groups. You are so eager to learn and that is an awesome quality to have! I've got my pom-poms out girl! Cheering you on! Thank you so much for taking the time to read my post, much less comment! I know I have so much to learn, but I am up to the task ! Thanks for including me in your groups and for ALL of your encouragement; you do not know how much that means to me!! Setting goals is important to keep me organized. I am working at getting better at it for 2016 also. Thank you so much for reading and commenting. We can work on our goals together! I was talking to my Mom this afternoon about the fact that I have not completed my monthly blogging calendars yet, and how much I need to sit down and map out my goals. I am behind in my planning, but thanks to a cancelled meeting tomorrow morning, am getting the chance to catch up. I definitely do need to join in intentionally setting goals! Good luck and God speed! Thanks for visiting and commenting! Please feel free to join with us each month and we can encourage each other! I see you use a planner. Do you blog about planners? If you ever do, consider joining my Planner Bloggers Support group on Facebook. :) We are a friendly bunch and we mostly also blog about other stuff, but sometimes planners! I don't usually blog about planner, but my next post in this series talks about the one I use. I will definitely check out your FB page! Thank you for reading, commenting, and inviting me!